Home Say aloha to our newly minted docents! 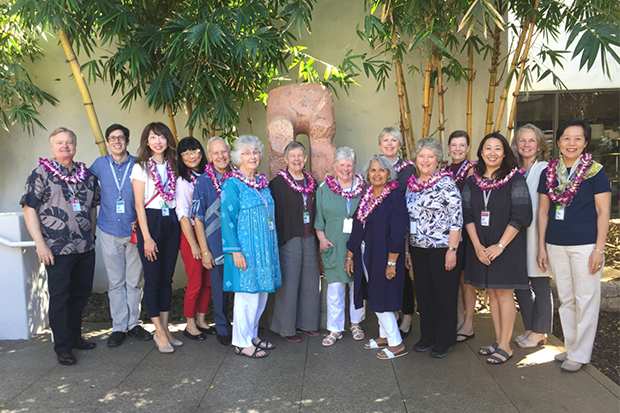 Say aloha to our newly minted docents! There are some new faces at the museum. You might see them strolling through the galleries or leading a school tour through the Chinese garden. A surefire way to meet them is by attending one of the many tours the museum offers. Yes—a new class of docents just graduated last month. Docents are crucial to the museum’s public programs, especially tours, and these dedicated art lovers undergo rigorous training. In this newest group of docents are Susan Clifford, Etsuko Douglass, Yoko Fujimoto, Toni Hathaway, Nan Kleiber, Kathy Krammer, Kristin McAndrews, Marcia Morse (a long time docent who wanted to refresh and reacquaint herself with the museum’s collection), Tony Picard, Sachi Takahashi, Mayumi Takeuchi, Chikako Tsuchiyama and Sheila Seifers. “What I love most about becoming a Honolulu Museum of Art docent is that it has given me the chance to give to the children of Hawai‘i the opportunity to learn not only about art but also about their heritage and history,” says Sheila Seifers. The group started weekly training in September 2018. According to HoMA curriculum specialist Justin Davies, the training focused on three main areas: building background knowledge about the museum’s collection and resources, developing tour techniques with an emphasis on school tours, and helping new docents explore and research their own abiding interests in connection with the museum’s collection. To learn the ins and-outs of HoMA, the group visited Spalding House, the docent library, the Robert Allerton Art Library and the Lending Collection. To enhance their museum knowledge and put it in context, they also visited other important Hawai‘i institutions like the Mānoa Heritage Center, Temple Emanu-El, ‘Iolani Palace and the University of Hawai‘i of Mānoa Hamilton Library. Training also included presentations by guest lecturers on topics relating to art and Hawai‘i, such as Kamehameha III Sculpture and Introduction to the Art in City Buildings Collection by Tory Laitila, registrar for the mayor’s office. The course culminated with students choosing a topic related to the collection. They had to conduct research then present it at the Docent Colloquium. Our inquisitive docent class’s fascinating presentations included Still Art and Dynamic Movement; Nonverbal Communication: Interpretation in Western Portrait Painting; and Georgia on my Mind: O’Keeffe for Kids. Those who would become Japanese-language trainees also created a collaborative museum highlights tour in Japanese. “My life is enriched not only by what I have learned—and continue to learn—and the friendships I have made with my fellow docents, but by all the dedicated people who are passionate about art and who strive to make the museum such a beautiful and welcoming place for all who visit,” says Susan Clifford. Congratulations to our newest class of docents! We can’t wait for you to spread your knowledge of HoMA.